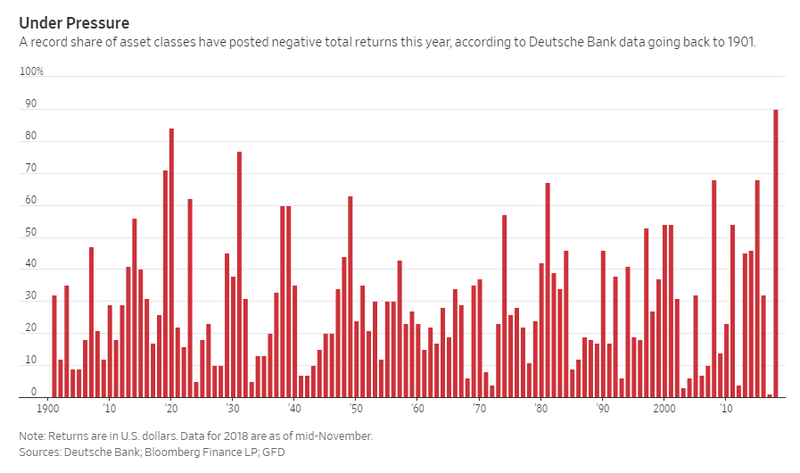 By one measure, 2018 is shaping up to be the worst for investors in more than 100 years. A huge number of asset classes will post negative returns for this year. But that might be good news. Bad years tend to usher in positive returns in the years that follow. For some, this is yet another log on the bear market fire. But for me, this could be a contrarian indicator. 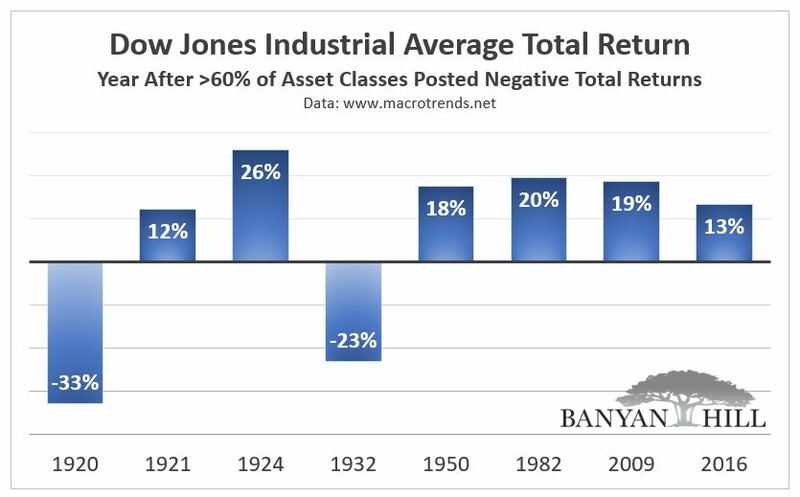 In 1920, 84% of asset classes had negative returns. One year later, only 22% finished in the red. In 1931, 77% of asset classes lost ground. One year later, only 31%. More recently in 2008, 68% of asset classes went red. That number plunged to 14% in 2009. And we know what happened from there — U.S. stocks began an epic bull market. But what about those other years? Do bad years always produce good returns in the following year? Not always. But enough to make the discovery notable. I looked at the Dow Jones Industrial Average’s performance the year following a year in which more than 60% of asset classes posted negative total returns. The Dow posted double-digit returns in six of the eight years. It posted double-digit losses in the other two years. Of course, market cycles do not fit neatly inside calendar years, but the data is notable. It provides some confidence to jump back into the stock market now, or at the very least, soon. But where exactly to jump in? U.S. stocks have been top performers in the years cited above. And recently, natural resources have done well. Since we’re late in the business cycle, you should consider adding gold and materials stocks. An easy way to tap into materials is with the S&P Materials Select Sector SPDR ETF (NYSE: XLB). This exchange-traded fund (ETF) won’t give you exposure to gold, but you’ll be positioned to profit from stocks that will do well as economic activity takes aim its cycle peak.